Tomas Chamorro-Premuzic is Reader at Goldsmiths, University of London, Research Fellow at University College London, and Visiting Professor at NYU in London. Chamorro-Premuzic has published more than 100 scientific articles and authored four books, including the textbook Personality and Individual Differences (also published by Wiley-Blackwell). He is a keynote speaker of the Institute of Economic Affairs and makes frequent media appearances in the UK and internationally. Sophie von Stumm is an award-winning young scientist who completed her postgraduate training at the University of Edinburgh and Goldsmiths, University of London. She is currently a Senior Lecturer at the University of Chichester. Her research interests focus on intelligence-personality associations in relation to educational, social, and health outcomes. Adrian Furnham is currently Professor of Psychology at University College London. He has lectured widely abroad and held scholarships and visiting professorships at, among others, the University of New South Wales, the University of the West Indies, the University of Hong Kong, and the University of KwaZulu-Natal. Furnham is a Fellow of the British Psychological Society and has written over 700 scientific papers and 60 books. He is on the editorial board of a number of international journals, as well as the past elected President of the International Society for the Study of Individual Differences. "That a fresh and comprehensive statement on current understanding about individual differences! This meaty volume provides an unusually deep discussion of personality and mental abilities like IQ and emotional intelligence, digs into their biological roots, and explores their importance at work, in relationships and in health. With the recent explosion of research linking these topics, the time is right for this wonderful update. Don’t look for this Handbook on my bookshelves – it will be on my desk and in use. Some of the world’s top researchers give us authoritative and engaging overviews of the central topics in individual differences, such as personality, creativity, intelligence, genetics and evolution, work, motivation, special abilities and happiness, making this a comprehensive guide for understanding how and why people differ. This handbook provides a diverse multidisciplinary collection of chapters by leading researchers. Domains covered range from intelligence to personality, interests, and motivation – and from basic research on brain functions to real-world implications in the workplace and beyond. — Phillip L. Ackerman, Professor of Psychology, Georgia Institute of Technology, Atlanta, USA. There is much in this handbook that does not simply summarise present knowledge but foreshadows the future state of differential psychology. Of use to the beginning student as well as the seasoned psychologist, any serious psychology library should possess this handbook. This impressive collection of antecedents, contemporary theory, and the latest empirical research does not shy away from controversial stances or highlighting consensual elements of the field, making this a must read for students, practitioners and researchers alike. 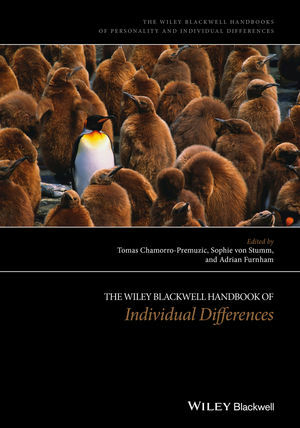 With contributions from many leading researchers in differential psychology, The Wiley-Blackwell Handbook of Individual Differences provides an up-to-date and comprehensive overview of individual differences research. This book will be a valuable resource for anyone interested in the field. With thoughtful and well-written chapters – ranging from the genetics of individual differences, to the relation between intelligence and personality, to the traces that different individuals leave behind in their physical environments – this handbook manages to be both highly readable and thoroughly informative.